Nora "Jane" Levy, born January 31, 1934 in Ottawa, Illinois died February 14, 1999, of a heart attack. She is survived by Chuck, her beloved husband, for 43 years, and daughter Dawn Renee Levy. Jane was an active volunteer most of her life, bringing her own special brand of compassion and common sense to the many lives she touched. For the last 17 years she has been known as the "Voice of the Alzheimer's Helpline" and an integral part of the New Mexico Alzheimers Association, a cause she embraced so that no other families would be alone and without support as her family had been during her mother's own illness. She will be greatly missed by her family, her cats, people throughout New Mexico, and across America through the internet. A memorial service will be held at 1:00PM, Saturday, March 6th at Ballut Abyad auditorium, 6600 Zuni, SE. Cremation has taken place, with private burial service in the Santa Fe National Cemetary. Arrangements were through Sunrise Society of New Mexico. Editor's note: For more information please contact Liza513@aol.com. Was very upset to hear that Jane had passed away. But I do want to express my thoughts at this time. I, for one, will miss her very much, as I know everyone who knew her will. Jane was always there if you needed her and willing to help. She was a loyal friend and member of all our groups and always available with helpful information. I am reminded of her sense of humor and that she always made me smile. Yes, she will be missed. My thoughts go out to Chuck and her family. I can imagine what they must be going through at this time. My prayers are with them. Well fellow-members I have known Jane for about 14 months (seems like a lifetime). Just to have a listener meant so much but she was more than that. Let us all take comfort in knowing that God needed another "angel", God bless each of you and will be talking with you in our chats. Dear heavenly Father, help us to face the day without our dear friend, Jane. Take care of her now that we no longer can. We know she is safely with you and enjoying her heavenly rewards, but we miss her so much. It is hard for us to understand and we have so much pain. Be with us as we grieve our loss and help us to understand. Thank you for all of the blessings you have bestowed on us, but especially today, we thank you for the blessing of the time we have had to know Jane and to love her. Take care of each of us as we go on with our daily lives. In Jesus' name we pray. Amen. It is with a heavy heart that I write this. But I know she is in a better place and will be watching over all of us. My best memories of Jane, are all of them. She was always there when we needed her, no matter what time of the day or night. When I first started going to the chats, I would just sit back and watch, I didn't know where to start, but Jane just reached out and grabbed me, as if to say, "Just jump right in, hon", and that I did. She had the sixth sense of knowing who and when someone needed immediate attention, or she would call you on the phone, and say "I just wanted to hear your voice to make sure you are okay". She did this on several occasions when I was upset while we were talking online. I live in NC near the coast, and we had a hurricane in September, she called several times to check on my family and myself to make sure that we were okay. She was a very compasionate person and touched the heart of every person she met, and she singled out no one, she was there for all of us giving herself freely to the needs of other people, while putting her own needs aside. She made a deep impression in my heart and these and other fond memories, I will always cherish. GOD called home one of his favorite Angels, AlzJane 198!She will be deeply missed, but after planting thousands of seeds on this earth, her goodness will always be with us! I'm not dealing with those demons anymore"
I know that Jane was special to a lot of people, and I am no exception. She knew every detail of my pain regarding my husband, Marc. Whenever I was on line at the same time as she was I would get an IM from her wanting to know how I was! She always encouraged me to take care of myself. She was an angel on earth. She is now an angel in heaven taking care of us still. I miss her! I just found out from Jamie, that Jane passed away. I can't tell you how much she will be missed. I only met her a few months ago, through the group chat, but I can tell you she knew what she was talking about. She was a compassionate person, she would laugh with you or cry with you. She indeed had a gift...I took to heart her warm words of encouragement, and wisdom that she had gained through her own experience of a parent with AD. I appreciated the time and the chats, that she freely gave.It is a sad day, but somehow I think Jane would want us to go on fighting for our loved ones, and keep the faith that someday a cure will be found. I like to think that she is in Heaven, watching out for all our loved ones that has gone on before her. There must be smiles in Heaven for another angel has joined in. I will never forget you Jane, and the impact you made in my life.Thank you for that...Rest in Peace my friend! It was in January of 1998 that I found my way to the Alzheimer's chatroom. Our beautiful one, AlzJane198 took me under her wing almost immediately. At that time I was caring for two: my mother and my aunt. She helped me through Aunt Frances' decline and death in June, and was busy helping with Mother after her fall on December 10th, 1998. She was in ICU when Mother died on January 2nd, but when I returned home briefly in December, I found she was trying to get me to find out what happened. That was just like her: always helping others even when she was feeling bad herself. I remember the night Mother wouldn't take her meds. Jane showed up on the web like magic and told me how to crush the pills and put them in pudding. She had a sixth sense about knowing when we needed her. She was a very special, very needed, very important part of my last year of caregiving and of my life, and I will never ever forgot her. I didn't have a chance to meet her in person, but she will remain in my heart as a major part of my life forever. She must be at least an archangel in Heaven. I'm sure God hand-picked her specially for her mission. She had the ability to lift us up by laughter. I know she's still here, helping. I hadn't known Jane for very long, but from the first moment I joined the chatline, I felt that we connected in a special way. She helped me over several rough spots and I don't think I could have made it this past year if I hadn't had her support, wit and humor to keep me going. Several times we would be the only ones online for the chats and we would have the best conversations and if I didn't get online on time, there she would be on the phone telling me to log on. We shared a lot during those conversations. I'll never forget the day my dog was having puppies while during one of the chats, giving a play by play....Jane loved it!! Thought I should name one of the pups Alz. I will miss her greatly, but I know that she is still here in our hearts helping caregivers "get through the day". It will be very difficult to keep this short when it comes to telling of what Jane meant to me... As with many, she was My Second "Mom" !! My Heart is breaking from this loss. She was the most caring, understanding and loving person to so many who were in need. She knew me inside and out, and she was my "Late Night Companion" that pulled me through so many difficult nights. She was the first person to offer their Phone number to me, (of course the first time I called it... it was a wrong number!!! ) Our Jane and her "Typo's" !! To Jane.... "A 'Mom' To Me"
Whose feet make a patter. When "Mom" comes to mind. There's those who become "Moms"
Like a Smile for a sob. When I fight off bad thoughts. And how good things will be. WHAT JANE MEANT TO ME WAS THE GIFT OF PATIENCE, FAITH, WILL, AND UNDERSTANDING. IT WAS THAT BIG HEART THAT WELCOMED ANYONE AND JUST BY HER WARMTH MADE YOU FEEL THAT YOU WERE NOT ALONE. SHE WAS FUNNY AND HAD A SPECIAL WIT. SHE MADE YOU FEEL LIKE YOU WERE A LONG LOST FRIEND. COMFORTABLE WAS HER BEST DESCRIPTION. SHE MADE EVERYONE COMFORTABLE AND WELCOME. ACTUALLY THERE ARE NOT WORDS ENOUGH TO DESCRIBE WHAT SHE HAS MEANT TO ME IN THE LAST YEAR. THAT'S ALL THE TIME I HAD TO KNOW HER. I'M THANKFUL FOR THAT SHORT TIME AS NOT HAVING KNOW THIS ANGEL WOULD HAVE LEFT A WHOLE IN MY SOUL. I KNOW THAT IT MUST BE REALLY HARD FOR THOSE WHO HAD KNOWN HER LONGER AND SHARED SO MUCH WITH HER. MY HEART GOES OUT TO CHUCK AND DAWN BUT MY THANKS GOES TO THEM FOR SHARING HER WITH ME AND SO MANY. HEAVEN HAS A NEW ANGEL AND ONE WITH A HUGE HEART. THE HUMAN PART MAY HAVE STOPPED BUT THE DIVINE PART WILL LIVE ON IN THE PEOPLE SHE HAS TOUCHED. It is just too hard to believe that I will turn on my computer and Alzjane198 won't popup on my Buddy List. Jane was the first person I met online when I got my computer. We instantly became chat buddies and often late at night on the East Coast, she would IM me to make sure I was OK and want to know what I was doing on the puter soooo late at night. We often talked about our cats and often, just about life itself. She always wanted to know how my Mom was doing and continually offered words of compassion and understanding. What a wonderful lady and how fortunate for me to have known her. My prayers and love to her husband and family. When I sat down to write this, I thought it would be easy, but what could I say about Jane that everyone doesn't already know? Do I tell you that she had a heart which was much larger than her person and it must have worn her out to carry it around with her? Do I tell you about those conversations we had which pulled me up out of the despair I was feeling and how she gave me the strength to do what needed to be done? Maybe I should tell you about how she would scold me when she knew I needed scolding while at the same time giving me comfort and support to face it. Do I tell you how excited and happy she was at the thought of getting to meet her online friends in October at the Gathering of Friends? Were you online late at night and all of a sudden a 'Jane IM' comes in telling you to 'Go to Bed...it's late'? Have you ever given her a compliment or just try to thank her for all her help and have her sign-off...because she didn't want compliments? Did she ever tell you that she just does what she does because she WANTS to help people...not for compliments? Friends, there are no words to describe Jane. I could say she is wonderful, sensitive and one of the most caring, supportative and concerned friends I've ever had...but those words are too 'small' to describe Jane. To me, there aren't enough words, nor adequate words to describe my friend Jane's spirit and soul. My life has truly been enriched knowing Jane and I will miss her terribly....but wait, maybe that is her voice I hear in my soul telling me to 'quit this grieving'. Yes, I think that was her, but she smiled and said it was okay to grieve for a little while, but not long because I had work to do so I best get on with it. Yes, that sounded just like my Jane, my second Mama. Sitting and listening in CSG the last couple of days has brought back wonderful memories of an outstanding lady, our dear friend Jane. So many things there are to think about. Jane's kindness, compassion, anger at times, her love of fun (99 bottles of beer on the wall, green chili cheese burgers and breaded pork tenderloins, not to mention how she loved to get me on my "supposed" dislike of kids), her love of people, and mostly, her love to help people. It was an unanimous consensus the woman was a wealth of information. God what that woman knew! Jane had a unique way to pick out the "newbie" and make that person feel like they had been part of the group for as long as she had. We all knew that practically any time we would come on-line that it wouldn't be long before Jane would be knocking at our screen, asking if all was ok, offering her shoulder, giving a hard time, and letting us pick on her. She taught us that we all have value in this life. She taught us that none of us can do this alone. She taught us to pick up on clues from what our friends are telling us. She taught us to listen and love with an open heart. She taught us there is no easy way out; that we have to face the situation realistically, no matter how difficult. She taught us that by listening to others problems, we would for just a brief minute, forget our own and feel such reward for being able to help someone in trouble. But mostly, our dear friend taught us that regardless if we have met in person or not, we are all very strong and wonderful individuals, and a wonderfully united, loving and caring group of friends who love and care about all we touch. My dear friend, I am so thankful you have touched all of our lives. I know you have taught all of us well. We just need to keep you close to our hearts and rely upon the wisdom you imparted to us. With each "newbie" that crosses our screen, I know each person we touch will have your love and influence passed on to them. I will miss you my dear friend! Hopefully, I can find all the right words to express how very much I loved, cared for, and admired Jane. She was a special person in my life and all of our lives. She took me in like a little stray puppy and made me feel loved and special. I can think only of a few people that I have ever met that loved and genuinely cared for people as Jane did. Jane taught me how to be strong and not feel sorry for myself, but if I did once in a while, I wasn't to feel quilty. She was firm with her advice, but always gave it with love. Her sense of humor was one of her greatest assets. She could always make us laugh, but only when the time was right. I didn't know her as long as some of you, but I feel I have known her forever. She blessed all of our lives and everytime I think of her I will be blessed by her memory and know that her sweet spirit lives in all of our hearts. I miss you Jane, but all that you have given to us will be cherished and never forgotten. I love ya gal. Valentine's Day has become a memorable day in my life. In 1997 I got laid off from my job and my son-in-law set me up with this computer. Those events have led me down a path I never expected. With my desire to learn more about the devastating illness that is taking my mother, I stated to search and in my quest, I stumbled into a support room chat. Never, in my wildest dreams, could I have imagined the love, the help, and the support that I would find through this box that sits on my desk. Nor did I expect to find a special person who became so very important to me, my beloved AlzJane, Jane, my friend, my sounding board, my "Mama Hen". She became the one I talked to daily, eventually even on the telephone. That deep, gravely voice could make me laugh when I wanted to cry, gave me support and comfort when I was confused and lost. She helped me to make the decision to relocate to be closer to my Mom, picked me up when I was down and depressed. She listened, scolded and pushed me to make decisions that needed to be made. And always it was with love, always I felt her love. I will feel a void in my heart forever and yet, I know she will always be with me. She is one of those remarkable people who forever change one's life and make you a better person for knowing her. The tears I have shed at her passing are not for her, for I know she is in a beautiful, peaceful place but for me, and my loss and the loss of all who knew her. She was the Caregiver of the Caregivers and will be missed everyday, forevermore. But we will carry on, fighting the fight she fought for so long, stronger because of her. How can we miss someone so badly when we never even spoke or met? You were one of the first people we chatted with, and we knew you would always be there for us. Your wisdom and caring will be deeply missed. The chat will never be the same without you, but we will carry on to continue your spirit of helping others. Thank you for your help and inspiration. AlzJane198 is a name in my buddy List. Such enjoyment my heart will forever miss- as I still expect it there. A blank spot will remain in the place it did appear. A hope unfulfilled. A chance at meeting -missed. I feel hurt that bores through my being- in every bone and soaks my soul. Jane, you are understanding, listening, caring, concern, love, acceptance, hope, a link, a friend, family. I remember the horns that would keep us in line. A heart that had no bonds or strings attached. As blank as that spot on my screen will remain - so will be the place in my heart. Yet, My mind recalls... the laughs, the fun, the pain shared... the anger lessened because you took the time to care. A hand you reached out to me when I was unable. Your heart you opened. You guided, taught, listened, understood, and cared. You loved me... how could that be... Jane, If I could be but a miniscule of what you are... to the people I do meet, be it in person or on a screen, it would be yet another blessing that you have imparted to me. I wanted to share my feelings about Jane. 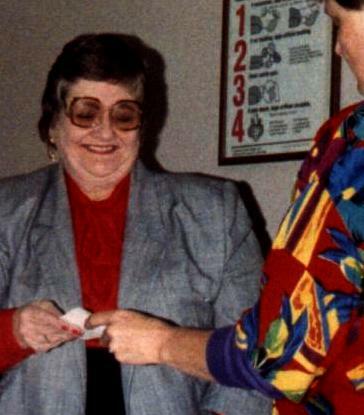 I was caring for my mother (she passed away March 11, 1998) when I joined the support group. Everyone was really nice, but it was Jane who was just great. She was always so caring and always had kind words to say to make you feel better. I always looked forward to checking my mail and seeing all of the neat things that Jane had sent. I could always count on her. I only wish that I could have met her and had a real face to face friendship with her. I will miss her !!! We're all going to miss you, because you cared! you let us vent, then laugh it through. Alzjane198, I will always remember you. This has been the hardest Ribbon I've ever had to put together. You guys have been so good in responding for Jane. All I can say is that Jane has touched so many lives in her 17 years of taking care of her mother and then helping with the NM Alzheimer's Association. She set such a wonderful example and I'm hoping that I, as well as many of you will become involved to the degree that she was. We must continue to carry on the example that our Beloved Jane set. God Bless You Jane. I feel that he called you home to help our loved ones get adjusted to their new lives up above. Now we pull together to help each other as you helped us.